• Pan Borneo Highway project in Sabah and Sarawak to continue, subject to cost rationalisation study. • RM500 special payment for civil servants up to Grade 54 and RM250 for government pensioners. • Credit system for sales tax deduction from January 2019 to avoid double taxation and to reduce business costs. • Special voluntary disclosure programme for taxpayers to declare unreported income. • Inland Revenue Board to investigate extraordinary wealth. • Government to recoup at least RM1 billion from anti-smuggling and anti-fraud efforts. • Departure levy proposed for all international outbound air passengers from June 1, 2019. • Casino licence fee up from RM120 million to RM150 million annually. • Machine dealer’s licence will be raised from RM10,000 to RM50,000 annually, while tax on gaming machines also up from 20% to 30% of gross collection. Petronas dividend of RM30 billion. • Government to improve cost of living aid for B40 group, to be given in a more targeted manner, with 4.1 million households expected to continue receiving financial aid from government via RM5 billion allocation. > Households with monthly income of RM2,000 or lower to get RM1,000. • Government will subsidise RON 95 petrol for cars with the engine capacity of 1,500cc, and below, and those with motorcycles with engine capacity of 125cc and below. • Price of RON 95 will be floated based on Automatic Price Mechanism (APM). • RM10 million allocation to work with NGO and social enterprises . • One-off assistance of RM500 will be paid to pensioners who are receiving pensions of less than RM1,000. • Minimum wage to increase to RM1,100 nationwide starting Jan 1, 2019. • RM100mil for Health Protection Scheme with health screening pilot project for 800,000 people from B40 group ages 50 and above. • RM1 billion fund for first time house buyers with income less than RM2,300 per month. • Government to freeze toll charges on all highways in 2019 with financial implication of RM700 million. • Education Ministry to get biggest allocation of RM60.2 billion, including RM2.9 billion education aid proposed for disadvantaged students. • Tax exemption for companies that assist its staff to settle their PTPTN loans by the year ending 2019. • Individual tax exemption for SSPN Saving Scheme increased from RM6,000 to RM8,000. • RM100 million earmarked to prepare Malaysian athletes for 2020 Tokyo Olympics. • RM926 million allocated to build and upgrade roads including in rural areas and bridges. • Access to power and water supplies in rural areas to be improved with allocations of RM694 million and RM738 million respectively. • RM10 million to set up another 50 childcare facilities in government buildings. • RM2 billion proposed to encourage investment in green technology industries. 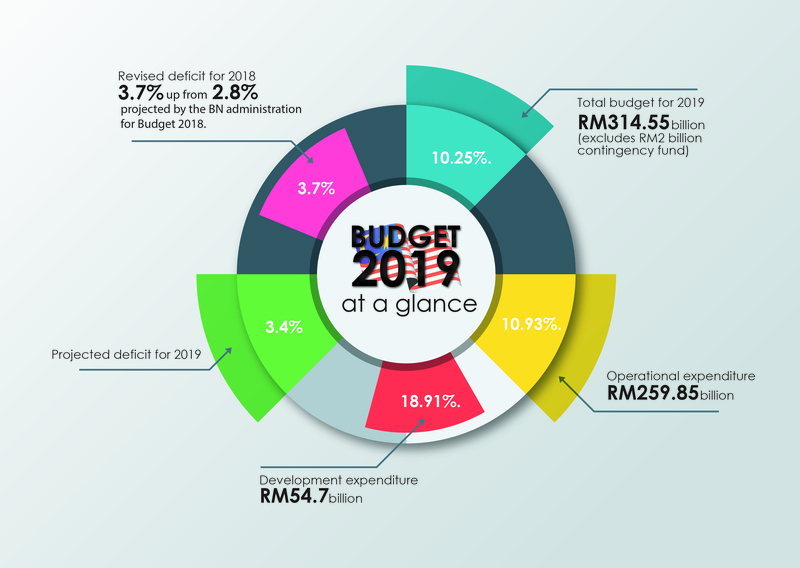 • Budget provides a total allocation of RM314.5 billion compared to RM290.4 billion in 2018 – with RM259.8 billion allocated for operating expenditure and RM54.7 billion for development expenditure. • RM286.8 million proposed for MACC operating expenditure. Budget for prosperity 0 out of 5 based on 0 ratings. 0 user reviews.